The end of the trout season and onset of Autumn is an uncertain but often exciting time. In 2014 the remnants of hurricane Gonzalo are hurtling towards the UK and hopes of an Indian summer are rapidly vanishing. Never mind as the latest you Tube clip “Autumn Sunshine; Fly Fishing for Grayling” demonstrates we have made hay while the sun shines. For prospective grayling anglers good advice is to keep an eye on environment agency river levels. A rising and colouring river will provide little joy, but one that is fining down and clear after rainfall will provide the best sport. 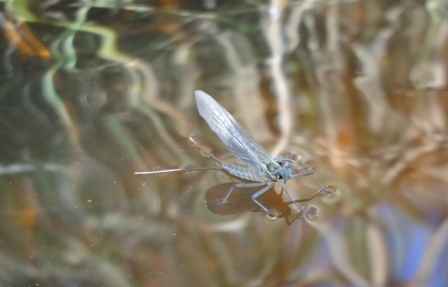 The latter is often accompanied by hatches of pale wateries, a beautiful small delicate, straw coloured mayfly species (pictured) and these are real grayling candy. When grayling are free rising and the colours are changing in the trees then most river fly fishers are happy. In these circumstances my favourite dry flies are the Match the hatch Pale wateries in size 16 and the O.G. emerger. The latter will rise grayling even in the absence of a hatch. If you are interested in these flies they are available to buy here. The fly fishing techniques we use to catch grayling are versatile and range from dry fly, to spiders, small nymphs under dry flies or indicators, Tenkara and the so called European nymphing techniques (Czech, French, Polish nymphing). When the grayling are feeding a good challenge is to try and catch fish on all these methods from the same pool. Any other methods? Well I have seen Fred Bainbridge catch grayling on a streamer/tadpole! If you are interested in being guided please visit our Stream guiding page or get in touch using our Contact Us form. I will be making a concerted effort to update these web pages and finish the e-book in the forthcoming weeks so keep checking.